They have achieved quite a lot over the past year, as anyone who has visited any of the GCR events involving freight trains will have seen. 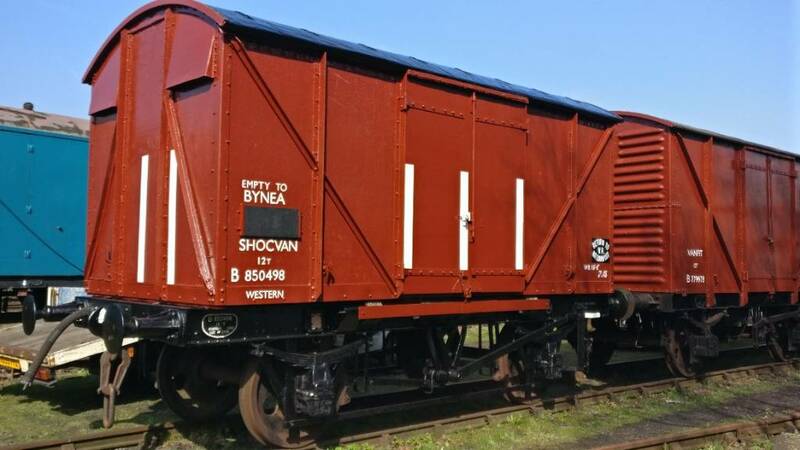 This is their latest finished restoration job, which formed part of the van train at the Winter Gala. Gtb. Man, AndyY, Graham Phillips and 3 others like this. The one on the right looks fairly "finished" whilst they were applying top coat to some of the lettering on the other whilst we sat in the loop for 15 mins. The yellow one reminds me of my old Hornby Dublo models of similar tank wagons. Wonder if both will be out for the "Goods Galore" gala next month? Corbs, big.stu, pmh_74 and 3 others like this. Both the tanks will be out for Goods Galore. We (the Quorn Wagon Group) haven't been working on these tanks, this has been the work of the Swithland Wagon Group. Here is a picture of our most recent finished project. Corbs, oddsocks, Bluenosejohn and 5 others like this. The Swithland wagon group was originally set up to try to do something with some of those vehicles which had been festering for too long with no obvious prospect of getting fixed any time soon. We took on A6071 because although it had been used in traffic, it was stopped for a 'youth group' repaint which faltered, leaving it a splodgy mess which was unable to run for mainly cosmetic reasons. Many people have worked on it on and off over several years but the majority of the work in recent years has been done by two people (Tom and Keith) with one other (David) taking on the signwriting. A6581 was then taken on because, having done one tank wagon, they felt like doing another, and it has happened much quicker too. The yellow livery was actually carried by this wagon so it's authentic. Obviously there are some finishing touches still to do, and at some point we'd like to add replica works plates (there is still a slight query over the registration month for A6081, for the star plate), but in any case it will be nice to see them run after all this time. Thanks are also due to the respective owners (both vehicles are privately owned) for funding the paint etc. I can't claim much credit myself other than some historical research and setting the group up in the first place; having a young family means I'm currently not able to put much 'hands on' time in myself. big.stu, Bluenosejohn and gwalkeriow like this. The speed with which they are getting some of their wagons restored to service is remarkable. If you look at their website, their Insulfish van has received a full repaint + signwritten over a period of 12 days, and, I'm guessing they may only have been working on it a maximum of 5 days in that period! Yep, it was a 2 weekend turn around time. 4 full days working on the van, and then our sign writer has been popping in after his early shifts this week to finish up the sign writing. 5 days wasn't a bad guess. The fish van was a pretty solid vehicle to start with, so only required sanding and minor repairs to bring it back into service. The next project is going to be a bit more involved. big.stu and Bluenosejohn like this. Just to add to this thread, there are also 13 Windcutter 16T Mineral wagons also at Quorn. These are currently withdrawn from the working rake (which is kept at Swithland sidings). There is now a separate thread on here about the Windcutter restoration activities. The activities of the Quorn Wagon Group have nothing to do with the Windcuter wagons. I think it would be appropriate for you to highlight this groups activates within the Windcutter thread you have started. It is good to see the website of the QWW is being kept updated every week - well done on all the work. Alongside the web site, which as Flying Phil said is updated weekly on a Sunday evening/Monday Morning, We now have a Facebook page, so those of you who are Facebook inclined can keep a track of what we are doing on there too. You don't hang about when you are restoring things! With other 75 vehicles we haven't got the time to hang about. Well done on the woodwork etc and in keeping the website up to date. oddsocks and Bluenosejohn like this. Good work Mattie, thanks for the update. gwalkeriow, oddsocks, Flying Phil and 2 others like this. Bluenosejohn, gwalkeriow and oddsocks like this.